Butternut Squash and Cheese Baked Polenta with Chanterelles - A recipe from Savor California, the online showcase for extraordinary gourmet foods and beverages from California. Cut squash in half and remove seeds. Roast halves cut side down on parchment lined sheet pans until tender. Scoop squash into a bowl and mash coarsely, drain and reserve. Spread pine nuts on a sheet pan and toast in the oven until golden, taking care not to burn. Pulse in the food processor to coarsely chop. Head olive oil in a skillet and add onion and sage. Season with salt and pepper and sauté over low heat until softened and caramelized, lightly golden, adding water if onion mixture appears dry, cool and reserve. Bring 6 cups water to a boil, salt liberally. Whisk in the polenta and cook over very low heat, stirring frequently until tender and hydrated. Stir in 1 tablespoon butter, then the mashed squash, pine nuts, onion mixture and cheese. Stir well to combine and melt cheese. Pour the hot mixture into a buttered or greased sheet pan, flattening the top slightly. Refrigerate until firm, at least three hours. Remove the pan from the refrigerator and brush the surface of the polenta with melted butter. Bake in a 400F oven for an hour, or until the top is browned and crisped. Let stand for 20 minutes before cutting into serving portions. Slice chanterelles, and sauté in a very hot pan just skimmed with olive oil. Season with salt and add a little white wine or sherry. Sauté until all liquid is evaporated, then transfer mushrooms to a sheet pan and roast in the oven until caramelized evenly. 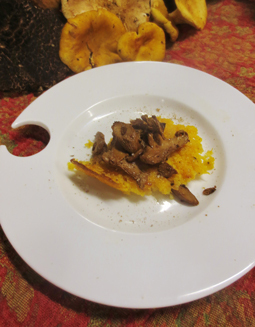 Serve a scoop of polenta topped with chanterelles and garnished with porcini salt. To make Porcini Salt: Grind 4 tablespoons dried porcini mushroom slices in a coffee grinder until a fine powder, then mix with ½ cup kosher salt.